The Expiatory Temple of the Sagrada Familia was an idea of a bookseller, Josep María Bocabella, literate and devoted man who in 1866 founded the Asociación Espiritual de Devotos de San José (Spiritual Association of Devotees of St. Joseph), whose objective was to achieve, through the protection of St. Joseph, the triumph of the Catholic Church in a time in which the phenomenon of dechristianization was impulsed by the Industrial Revolution and the accompanying social changes. In 1872, Bocabella went to Rome to make an offering to the Holy Father, and while returning from this trip he passed through Loreto, where he observed its beautiful church. 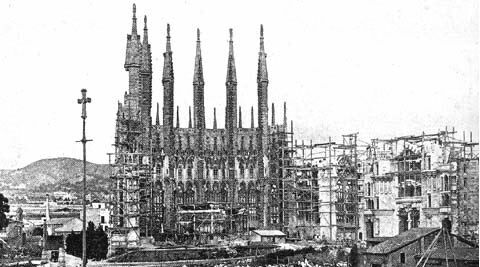 It was there that he had the idea of making an expiatory temple in Barcelona, dedicated to the Holy Family, as a replica of the church he saw in that Italian municipality. Beginning in 1876 Bocabella searched for a centrally located plot to build his temple, and he almost obtained it, since the Duchess of Almenara Alta was going to donate one which she owned, but she died before she made the donation. So then the Association had to find a plot further from the centre because its budget was scant. The plot which was acquired for 172.000,- pesetas occupied 12,800 square meters in the block delimited by Marina, Provenza, Mallorca and Cerdeña streets. In 1877 the architect Francisco de Paula del Villar offered to draw the plans for free. Del Villar’s project was totally neogothic: a church with three naves, with the crypt oriented according to the orthogonal axes of the block. The first stone was placed on March 19, 1882, on the festival of St. Joseph. Gaudí officially took over construction on March 18, 1883 (although he had intervened one year before) because of some disagreements between Del Villar and the council, represented by Juan Martorell Montells. Del Villar wanted to use ashlar columns, which was much more expensive than completing the interior with rubblework and then cover them with ashlar, and he argued with Martorell because the latter reproached him for spending much unnecessary money on the project. Then the architecture professor sent a letter to Bocabella telling him that if his instructions were not followed then he would resign his post. Bocabella had no other option than to accept his resignation because the project budget came from donations and he could not waste it. Later Del Villar claimed some fees which were never agreed to since, as we have stated, he had offered himself as a volunteer to create the plans for the temple with no compensation.